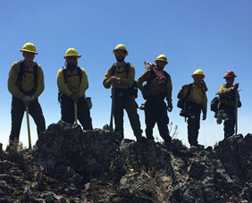 The HRSP Information Station is designed to help individuals serving in these positions, on wildland fire incidents, easily obtain the information needed to effectively fulfill their incident role. Provide a point of contact for Incident Personnel to discuss human resource and civil rights concerns. Keep Incident Management informed of concerns and possible resolutions of potential base camp issues that could lead to a hostile work environment. Participate in daily briefings and planning meetings to provide appropriate human resource and civil rights information. Prepare/Submit human resource messages to the daily Incident Action Plan (IAP), and post on incident bulletin boards. Conduct fact finding and provide documentation to appropriate home unit official for unresolved issues. Make a concerted effort to resolve issues informally, quickly, legally, and at the lowest impacted level before the parties involved leave the incident. Assist/Facilitate appropriate Critical Incident Stress Defusing/Debriefing/ Management procedures with IMT and CISM Team.